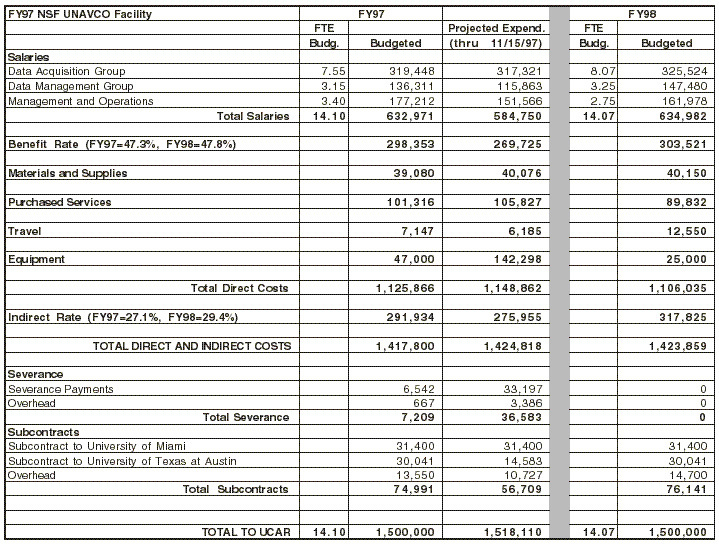 Table 8 shows a summary of current NSF funding of UNAVCO Facilities activities and the FY98 requests. Funds provided to the Boulder and Scripps Facilities are covered under this grant; all other funds are distributed through independent, peer-reviewed grants. The Boulder Facility is requesting level funding of $1.5M for FY98 based on the current best estimate of demand by NSF investigators for equipment, agent project, campaign, and permanent station installation support (Tables 4, 5, and 6). Additionally, the level of effort expended in FY97 for data management and archiving activity was sufficient to support the placement of data from almost forty projects into the Archive as well as the continued development of the Archive Database system in anticipation of the seamless archive implementation and growth of continuous data from permanent stations. Accordingly, level funding for those activities is deemed appropriate. The one area where additional Facility resources could be applied is in providing more direct support to investigators in oversight of the data flow from and entry of continuous data into the Archive Database from the over 90 permanent GPS stations anticipated by the end of FY98. The Facility's policy on such support to date is that the tools to support the data flow are available as well as the Archive capacity but ensuring the flow of data into the Archive remains the investigator's responsibility. Table 9 shows a summary UNAVCO Boulder Facility budget and expenditures for FY97 and budget request for FY98 for all groups and category of expenses. The FY98 budget request reflects overall level staffing and funding from FY97. 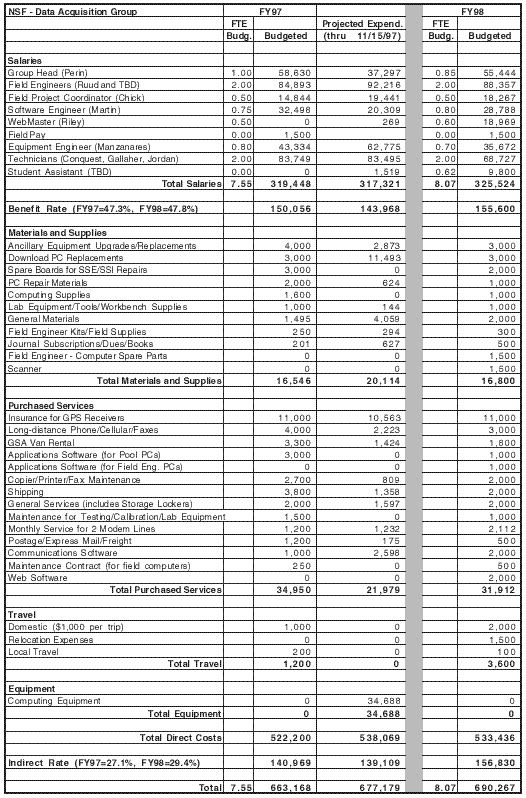 Detailed budgets for each of the three Boulder Facility groups follow. 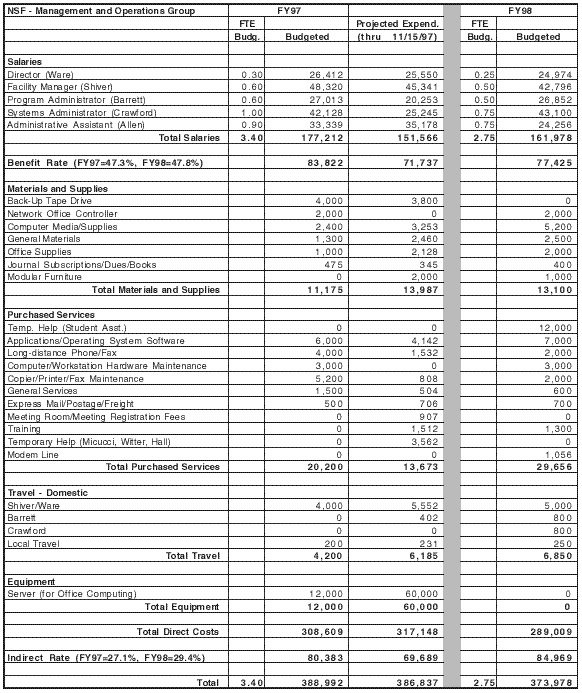 Table 10 (at the end of this section) shows the budgeted and actual expenditures for the Boulder Facility Data Acquisition Group (DAG) in FY97 as well as the projected budget for FY98. Staff expenditures in FY97 were generally as budgeted. 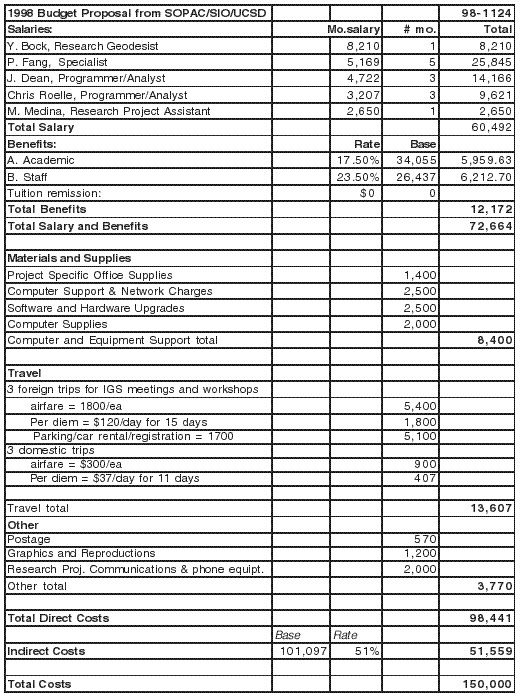 Other expenditures were generally as budgeted except for the high priority purchase of three PC-dockable field computers for field engineer staff, two desktop PC's for Web development and equipment inventory support, and some investment in network support hardware at a total cost of around $35K. These purchases were critical to replacing worn out equipment for the field engineers and to providing the Web development capability critical to the Facility's use of the Web as the primary information conduit to the user community. This made total projected expenditures for DAG over budget by $14,011. The starting point for analyzing the projected demand on the Facility for data acquisition support in FY98 is Table 4, which shows the currently known NSF-EAR projects requesting field engineer and equipment support and Table 5 which shows the currently known agent projects. The cumulative field engineer support required for the presently submitted and funded NSF projects is 56 work weeks; the comparable number for equipment technician support is 29 work weeks. A conservative approach to estimating at the beginning of the year how many field projects will ultimately be supported by year end is to assume that the number of projects will double as more proposals are submitted and new NSF grantees become aware of Facility resources. Agent projects can be assumed to be steady from FY97 to FY98 at 30. Applying the "doubling" rule to the known list of field projects results in a requirement for 112 work weeks of field engineering support. Accordingly, the FY98 budget request is for two field engineers. Equipment technician support is more difficult to estimate since much of the work is to support community-wide use of equipment as well as projects. Starting with the 29 weeks of known field project support requirements and using the doubling rule, 58 work weeks of equipment technician support is required for project support. Accounting for the many more agent projects and the support provided by the Facility for other GPS equipment throughout the community, the total technician requirement is estimated at two technicians. Other DAG staff adjustments in the FY98 budget include reductions in supervisory and management time by Barb Perin and Ed Manzanares, along with slightly increased support for Web activity and a student assistant to support equipment cleaning and repair. The net effect of these changes is to increase direct staff support to projects by about 0.5 full time equivalent (FTE) position while reducing management and general infrastructure costs. A brief description of DAG staff responsibilities is found in Appendix B. Other cost elements in the budget are self-explanatory. Overall, the DAG budget request is for a $27,099 or 4% increase over the FY97 budget. Table 11 shows the budgeted and actual expenditures in FY97 for the Boulder Facility Data Management and Archiving Group (DMAG) as well as the projected budget for FY98. Staff expenditures were slightly below budget primarily due to less charging by the group head, Chuck Meertens. The purchase and installation of the Digital Linear Tape (DLT) system was over budget by $12K plus additional associated software expenditures. 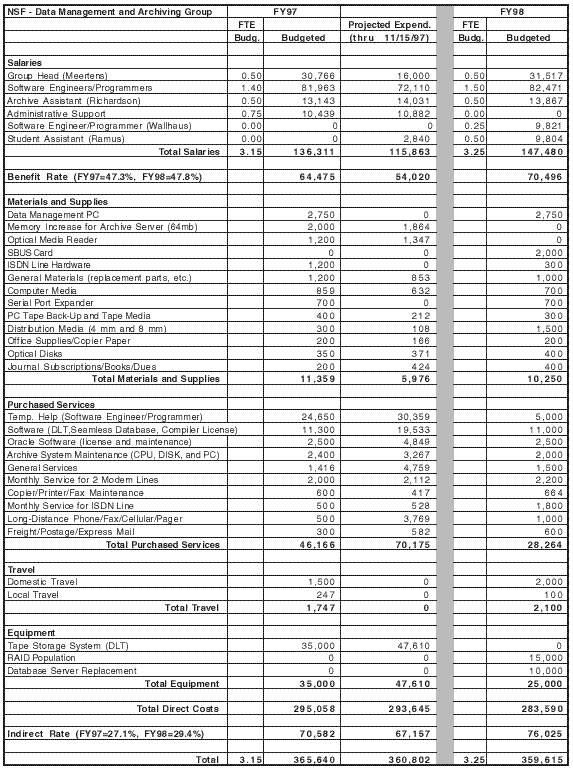 Overall, DMAG expenditures were under budget by about $5K. The FY98 budget for data management and archiving activities is slightly below the FY97 level. Staff are budgeted at 3.25 FTE, up from 3.15 in FY97, but all other cost categories are reduced. The FY98 proposed staffing shows a slight reduction in development tasks and an increase in data management and software support, including the transfer of communications download software development to the DMAG. Overall staff functions can be summarized as ~1.0 FTE for archiving of older campaign data and campaign data expected in 1997-1998, 0.75 FTE for retrieval and archiving of regional permanent station data, 0.5 FTE for maintenance and operation of the archive Oracle database and data storage system, 0.75 FTE for software development related to the database, seamless archive, data translators, quality control software, receiver download and communications software, and 0.25 FTE for general software support to the community. One goal will be to have more of Chuck Meertens time on the implementation of the seamless archive and development of new archive interface tools in FY98. A brief description of DMAG staff responsibilities is found in Appendix C. Some equipment purchases are anticipated in FY98 including further population of the RAID disk system to handle data from permanent stations and the potential need to replace the archive server at a total projected cost of $25K. Overall, the DMAG request for FY98 is $6,025 below the FY97 budget. Table 12 shows the budgeted and actual expenditures for Boulder Facility management and operations support in FY97. Staff expenditures were less than budgeted, attributable to less management participation in broader community-wide activities in FY97. This savings in staff costs was used for a one-time investment in network and desktop systems to replace four to five year old UNIX systems throughout the Facility. One each UNIX and NT network server for Facility-wide support and five NT system desktops for the Data Management and Archiving Group were purchased. This $60K investment will meet the needs of the Facility for centralized network support (UNIX and NT) and desktop applications (e-mail, word processing, database, graphics, and data analysis) for DMAG for the three to five year lifetime of the new systems. This investment was critical to the efficient operation of the Facility. All other management and operations expenditures for FY97 were approximately within budget. The FY98 management and operations budget shows a decrease of 0.65 FTE and $15,014 from FY97 based on the need to reduce management overhead, the desire to maintain a level Facility-wide budget from FY97 to FY98, and the need to fully fund other direct project support activities in the Facility. Increased funding support from other agencies has also allowed management and operations cost to be spread over a larger budget base. A brief description of management and operations staff responsibilities is found in Appendix D.
Table 13 shows the requested FY98 budget for Scripps support to the IGS and UNAVCO data archiving activity, including support for implementation of the seamless GPS archive.